Imagine the problems we will face when the world population grows to 9 billion or more. How to provide these people with food, potable water, health care, security and a clean environment? One essential ingredient to all these needs is cheap energy. Nuclear power can help to secure our energy supply. The natural fuel resources are abundantly available. With reactors of the next generation we can utilize uranium 100 times better and reduce the high-level waste. With thorium we can extract 500 times more energy from fission and avoid the production of long-lived nuclear waste. Nuclear energy fits in a sustainable energy mix. It is cheap and produces no greenhouse gases. The low price of nuclear energy can compensate for the more expensive renewables like wind and solar. Read on this website how nuclear reactors work and how we can make nuclear energy truly sustainable. 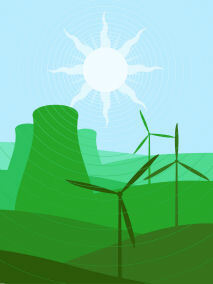 With a new generation of reactors and thorium as fuel we have an endless amount of green and cheap energy in our hands.